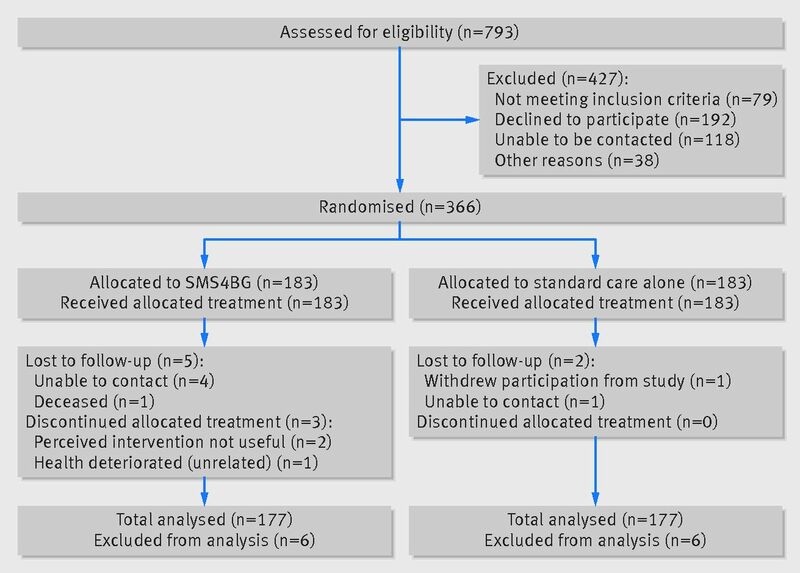 Objective To determine the effectiveness of a theoretically based and individually tailored, text message based, diabetes self management support intervention (SMS4BG) in adults with poorly controlled diabetes. Design Nine month, two arm, parallel randomised controlled trial. Setting Primary and secondary healthcare services in New Zealand. Participants 366 participants aged 16 years and over with poorly controlled type 1 or type 2 diabetes (HbA1c ≥65 mmol/mol or 8%) randomised between June 2015 and November 2016 (n=183 intervention, n=183 control). Interventions The intervention group received a tailored package of text messages for up to nine months in addition to usual care. Text messages provided information, support, motivation, and reminders related to diabetes self management and lifestyle behaviours. The control group received usual care. Messages were delivered by a specifically designed automated content management system. Main outcome measures Primary outcome measure was change in glycaemic control (HbA1c) from baseline to nine months. Secondary outcomes included change in HbA1c at three and six months, and self efficacy, diabetes self care behaviours, diabetes distress, perceptions and beliefs about diabetes, health related quality of life, perceived support for diabetes management, and intervention engagement and satisfaction at nine months. Regression models adjusted for baseline outcome, health district category, diabetes type, and ethnicity. Results The reduction in HbA1c at nine months was significantly greater in the intervention group (mean −8.85 mmol/mol (standard deviation 14.84)) than in the control group (−3.96 mmol/mol (17.02); adjusted mean difference −4.23 (95% confidence interval −7.30 to −1.15), P=0.007). Of 21 secondary outcomes, only four showed statistically significant improvements in favour of the intervention group at nine months. Significant improvements were seen for foot care behaviour (adjusted mean difference 0.85 (95% confidence interval 0.40 to 1.29), P<0.001), overall diabetes support (0.26 (0.03 to 0.50), P=0.03), health status on the EQ-5D visual analogue scale (4.38 (0.44 to 8.33), P=0.03), and perceptions of illness identity (−0.54 (−1.04 to −0.03), P=0.04). High levels of satisfaction with SMS4BG were found, with 161 (95%) of 169 participants reporting it to be useful, and 164 (97%) willing to recommend the programme to other people with diabetes. Trial registration Australian New Zealand Clinical Trials Registry ACTRN12614001232628. The flexibility of mobile phones and their adoption into everyday life mean that they are an ideal tool in supporting people with diabetes whose condition needs constant management. Mobile phones, which have been used effectively to support diabetes management,13141516 offer an ideal avenue for providing care at the patient’s desired intensity. Additionally, they can provide effective methods of support to patients in rural and remote locations where access to healthcare providers can be limited.1718 Although there is growing support for the use of mobile health (mHealth) in diabetes, there is increasing evidence of a digital divide, with lower use of some technologies in specific population groups.1920 These groups include people who have low health literacy,21 have low income,222324 and are members of ethnic minorities.2526 Contributing factors include low technology literacy, mismatch between individual needs and the available tools, lack of local information, cost, literacy and language barriers, and lack of cultural appropriateness.27 For mHealth tools to be used to manage poor diabetes control, they need to be designed to the needs and preferences of those people who need the greatest support by considering these factors. The SMS4BG (self management support for blood glucose) intervention was developed to address the need for innovative solutions to support self management in adults with poorly controlled diabetes.28 The individually tailored intervention provides information and support designed to motivate a person to engage in the behaviours required to manage their diabetes effectively for long term health improvement. The development of SMS4BG followed the mHealth Development and Evaluation Framework29 (including extensive formative work and end user engagement to ensure that it met the needs of the population it was designed to reach) is evidence based and theoretically grounded. A previous pilot study found SMS4BG to be acceptable and perceived it as useful.28 This study aimed to determine the effectiveness of the mHealth diabetes self management support programme—SMS4BG in adults with poorly controlled type 1 or type 2 diabetes, in addition to their usual diabetes care. A nine month, two arm, parallel, randomised controlled trial was conducted in adults with poorly controlled diabetes between June 2015 and August 2017. The study received ethical approval from the Health and Disability Ethics Committee (14/STH/162), and the protocol was published30 and registered with the Australian New Zealand Clinical Trials Registry (ACTRN12614001232628). Trial development and reporting was guided by the CONSORT31 and CONSORT EHEALTH32 statements. Participants were referred to the study by healthcare professionals at their primary and secondary care centres across New Zealand. Additionally, participants could self refer to the study. Eligible participants were English speaking adults aged 16 years and over with poorly controlled type 1 or 2 diabetes (defined as glycated haemoglobin (HbA1c) concentration ≥65 mmol/mol or 8% in the preceding nine months). The initial protocol required HbA1c concentration above the cutoff level within the past three months, but after feedback from patients and clinicians, this period was extended to nine months to ensure a greater reach across those people not having regular tests. Participants required access to a mobile phone and needed to be available for the nine month study duration. Eligible participants were randomised to either an intervention or control group in a 1:1 ratio. Randomisation was stratified by health district category (high urban or high rural/remote), diabetes type (1 or 2), and ethnicity (Māori and Pacific, or non-Māori/non-Pacific). The randomisation sequence was generated by computer programme using variable block sizes of two or four, and overseen by the study statistician. Following participant consent and completion of the baseline interview, the research assistant then randomised the participant to intervention or control, using the REDCap randomisation module. The REDCap randomisation module ensured that treatment allocation was concealed until the point of randomisation. Due to the nature of the intervention, participants were aware of their treatment allocation. Research assistants conducting the phone interviews were also aware of the treatment allocation. However, the objective primary outcome was measured by blinded assessors throughout the study period. Participants who were referred to the study by clinicians or who self referred were contacted by a research assistant via phone to discuss the study and confirm eligibility. All eligible participants completed informed consent followed by baseline assessment over the phone with a research assistant before randomisation. All participants continued with their usual diabetes care including all medical visits, tests, and diabetes support programmes throughout the study. In addition, the intervention group received SMS4BG. Control participants received usual care only. All participants completed a follow-up phone interview nine months after randomisation (within three weeks of the nine month date). HbA1c blood tests (at baseline, three, six, and nine months) were undertaken through standard care and results obtained through medical records. SMS4BG is an automated self management support programme delivered by SMS (short messaging service) to motivate and support people to engage in the behaviours needed for successful diabetes management. The programme was tailored by the needs and goals of the individual, and demographic factors. As well as core motivational and support messages (in Māori, Pacific, or non-Māori/Pacific cultural versions), participants could opt to receive additional modules including those for: insulin control, young adult support, smoking cessation, lifestyle behaviour (exercise, healthy eating, or stress/mood management), and foot care (further module details in supplementary table 1). Perceived social support for diabetes management (measured by use of a four item measure developed for this study assessing overall support, appraisal support, emotional support, and advice/information support; protocol paper provides measure details30). Cost effectiveness as well as healthcare use was assessed during the study period compared with the nine months before randomisation (presented separately). We measured patient engagement and satisfaction with the intervention using semistructured interviews and data from the content management system. The secondary outcomes health related quality of life and perceived social support were not included in the initial trial registration but added before commencing the trial. As published in the protocol, a sample size of 500 participants (250 per arm) was estimated to provide 90% power at the 5% significance level to detect a clinically meaningful group difference of 0.5% (5.5 mmol/mol) in HbA1c at nine months, assuming a standard deviation of 1.7% (18.6 mmol/mol). Despite extensive efforts, recruitment for the study was slower than expected, and with the limited overall study period available, a post hoc power calculation was conducted in September 2016. A revised sample size of 366 participants (183 per arm) was targeted, which would provide 80% power to detect the same effect size under the same assumptions. Statistical analyses were performed by SAS version 9.4 (SAS Institute). All statistical tests were two sided at a 5% significance level. Analyses were performed on the principle of intention to treat, including all randomised participants who provided at least one valid measure on the primary outcome after randomisation. Demographics and baseline characteristics of all participants were first summarised by treatment group with descriptive statistics. No formal statistical tests were conducted at baseline, because any baseline imbalance observed between two groups could have occurred by chance with randomisation. We summarised the primary and secondary outcomes using descriptive statistics at each scheduled visit. A random effects mixed model was used to evaluate the effect of intervention on HbA1c at three, six, and nine months’ follow-up, adjusting for baseline HbA1c and stratification factors and accounting for repeated measures over time. Model adjusted mean differences in HbA1c between the two groups were estimated at each visit, by including an interaction term between treatment and month. Missing data on the primary outcome were taken into account in modelling based on the missing at random assumption. Both 95% confidence intervals and P values were reported. Treatment effects sizes were also compared between important subgroups considered in stratification, including diabetes type (1 and 2), ethnicity (Māori/Pacific and non-Māori/non-Pacific), and region (urban and rural). For other secondary outcomes measured at nine months, we used generalised linear regression models with same covariate adjustment using a link function appropriate to the distribution of outcomes. Model adjusted estimates on the treatment difference between the two groups at nine months were reported, together with 95% confidence intervals and P values. No imputation was considered on secondary outcomes. Patients were involved in all stages of the study, including the initial conceptualisation and formative work leading to the development of SMS4BG (for more information, see the development paper28). Patient feedback informed the intervention modality, purpose, and structure, and patients reviewed intervention content before it was finalised. Patient feedback on the acceptability of SMS4BG through the pilot study28 led to improvements to the intervention including additional modules, the option for feedback graphs to be posted, additional tailoring variables, and a longer duration of intervention. Patient feedback also informed the design of this trial—specifically its duration, the inclusion criteria, and recruitment methods. Additionally, patients contributed to workshops of key stakeholders held to discuss interpretation, dissemination of the findings, and potential implementation. We have thanked all participants for their involvement and they will be given access to all published results when these are made publicly available. A total of 793 individuals were referred to the study and assessed for eligibility between June 2015 and November 2016. Of these, 366 were randomised to the intervention and control groups (n=183 each; fig 1). The final nine month follow-up assessments were completed in August 2017, with loss to follow-up (that is, no follow-up data on any outcome) low in both groups (overall 7/366=2%). A total of 12 participants (six per group) were excluded from the primary outcome analysis because of no follow-up HbA1c results after randomisation. Baseline characteristics of participants are presented in table 1, and no adverse events were recorded from the study or protocol deviations. The main treatment effect on the primary outcome is presented in table 2. The reduction in HbA1c from baseline to nine month follow-up was significantly greater in the intervention group than in the control group (mean −8.85 mmol/mol (standard deviation 14.84) v −3.96 mmol/mol (17.02), adjusted mean difference −4.23 (95% confidence interval −7.30 to −1.15), P=0.007). The adjusted mean difference on change in HbA1c at three and six months were −4.76 (−8.10 to −1.43), P=0.005) and −2.36 (−5.75 to 1.04), P=0.17), respectively (table 2). A decrease in HbA1c from baseline to nine month follow-up was observed in 75% (132/177) of intervention participants compared with 59% (105/177) of control participants (χ2 test, P=0.01). At nine months, 27% (48/177) of intervention and 17% (30/177) of control participants had HbA1c levels dropping to below 65 mmol/mol (P=0.024). We saw no significant interaction between the treatment group and any of the prespecified subgroups: type 1 versus type 2 diabetes (P=0.82), non-Māori/non-Pacific versus Māori/Pacific ethnicity (P=0.60), high urban versus high rural/remote region (P=0.38). Adjusted mean differences on change in HbA1c from baseline to nine months for patients with type 1 and type 2 diabetes were −5.75 mmol/mol (95% confidence interval −10.08 to −1.43, P=0.009) and −3.64 mmol/mol (−7.72 to 0.44, P=0.08), respectively. Adjusted mean differences for non-Māori/non-Pacific and Māori/Pacific people were −4.97 mmol/mol (−8.51 to −1.43, P=0.006) and −3.21 mmol/mol (−9.11 to 2.70, P=0.28), respectively. Adjusted mean differences for participants living in high urban and high rural/remote areas were −4.54 mmol/mol (−8.40 to −0.68, P=0.02) and −3.94 mmol/mol (−9.00 to 1.12, P=0.13), respectively (table 3). The main effect of the intervention on secondary outcomes are presented in table 4. No significant differences were observed between the two groups for self efficacy (SEDM). A significant improvement in foot care behaviour was seen in the intervention group compared with the control group (adjusted mean difference 0.85 (95% confidence interval 0.40 to 1.29), P<0.001) but no significant group differences were observed for diet (general or specific), exercise, blood glucose testing, and smoking behaviours (SDSCA). No significant group differences were observed for diabetes distress (DDS2). In relation to perceptions and beliefs about diabetes, a significant reduction in illness identity (how much patients experience diabetes related symptoms) on the BIPQ was observed in favour of the intervention (adjusted mean difference −0.54 (95% confidence interval −1.04 to −0.03), P=0.04). However, we saw no significant group differences for perceptions of consequences, timeline, control, concern, emotions, and illness comprehensibility. A significant improvement in health status on the EQ-5D VAS was observed in favour of the intervention (4.38 (0.44 to 8.33), P=0.03) but no significant differences were observed between groups for the quality of life index score. Finally, the measure of perceived support for diabetes management showed a significant improvement between the groups in how supported the participants felt in relation to their diabetes management overall (0.26 (0.03 to 0.50), P=0.03) but no significant group differences on appraisal, emotional, and informational support. Among the intervention participants, 169 (92%) completed questions at follow-up about satisfaction and acceptability of the intervention (table 5). Participants reported high levels of satisfaction with SMS4BG, and all but two participants thought that text messaging was a good way to deliver this type of support. Ten participants reported technical issues while receiving the intervention, most commonly issues replying to the messages (n=4), issues accessing graphs (n=2), and mobile reception issues (n=2). Owing to individual tailoring, participants in the intervention group received varying numbers of messages. Half the participants (92/183) received messages for three months, an additional 18% (33/183) chose to continue the messages for six months, and the remaining 32% (58/183) chose to continue the messages to the maximum nine months. Only three participants chose to stop their messages early. A total number of 76 523 messages were sent by the system to participants (median number of messages per participant 242 (interquartile range 122-511; range 14-2050)), and 16 251 messages of blood glucose results were sent into the system by participants receiving the reminders (68 (1-169; 0-917)). 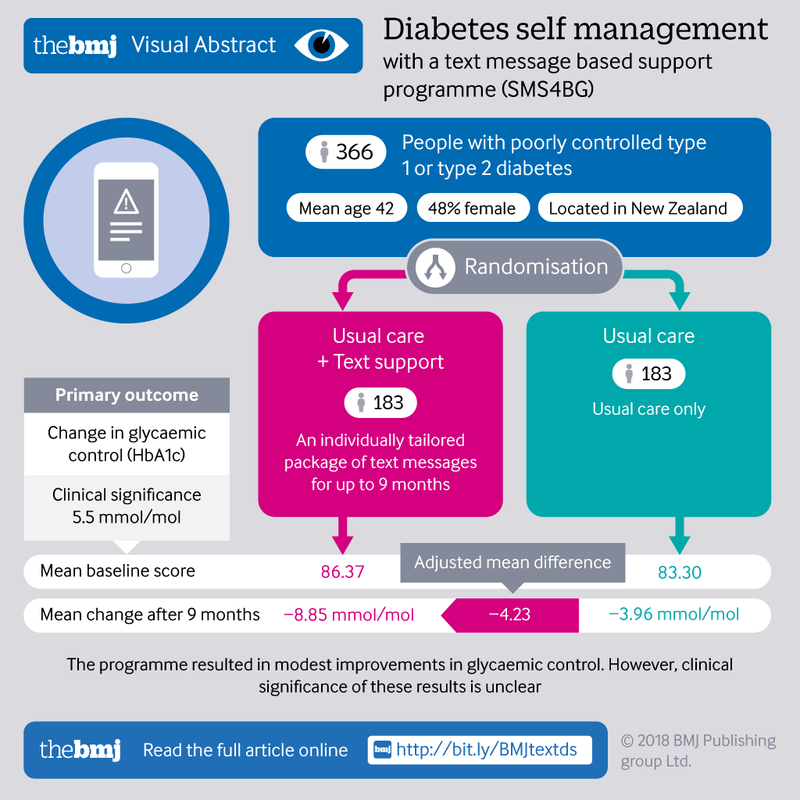 This study found that a tailored, theoretically based, SMS based, diabetes self management support programme led to modest improvements in glycaemic control. The effects of intervention were also seen in four of 21 secondary outcomes, including foot care behaviour and ratings of diabetes support. The programme showed a high level of acceptability with the overwhelming majority of participants finding the intervention useful and willing to recommend it to others. It is well documented that any reduction in HbA1c is likely to be associated with a decrease in the risk of diabetic complications.38 Reductions in HbA1c are much more clinically important at higher levels, given that the association between vascular complications and HbA1c is non-linear and that similar reductions at lower HbA1c levels have much less effect.383940 In a less ethnically diverse population of people with type 2 diabetes who had levels of HbA1c higher than 6.5% (53 mmol/mol), a decrease of 1% (11 mmol/mol) has been found to result in reduced microvascular complications by 37%, myocardial infarction by 14%, and risk of death by 21%.38 A total of 75% of participants in the intervention group experienced a decrease in HbA1c at nine months, with a mean reduction in HbA1c of 8.9 mmol/mol (0.8%) from baseline, and a significant group difference of 4.2 mmol/mol (0.4%) in favour of the intervention. Therefore, the results in this study have potential to be clinically relevant in reducing the risk of vascular complications and death, although further investigation is needed. The average reduction of 4.2 mmol/mol (0.4%) in HbA1c seen in this study did not reach the level chosen to signify clinical significance in the initial power calculation (5.5 mmol/mol (0.5%) reduction in HbA1c). Therefore, this study is unable to conclude that the effects of the SMS4BG intervention are clinically significant. Although further investigation is needed, we believe the results have the potential to still be clinically relevant in practice, particularly among individuals with high levels of HbA1c, such as the participants with poorly controlled diabetes in this study. The unadjusted group difference on change in HbA1c from baseline was −5.89, −3.05 and −5.24 mmol/mol at three, six, and nine months, respectively. The main analysis, with adjustment for baseline value and stratification factors, showed a smaller treatment effect, although both results were significant at three and nine months. Similar results were found across major subgroups of interest despite the fact that these analyses were not specifically powered. These consistent findings led us to believe that the intervention shows promising effects on treating people with poorly controlled diabetes and warrants further investigation. This study contributes to the evidence around the use of SMS to support diabetes management.131415 The improvements in HbA1c seen in this study are similar to those reported in meta-analyses of SMS interventions in diabetes not limited to those with poor control.141641 Unlike previous studies that typically focus on a particular population defined by diabetes type, age, or treatment, the current study provided an intervention for all adults with either type 1 or type 2 diabetes under any treatment regimen, enhancing potential reach and generalisability. The only limit on the population was the requirement that participants had to have poor diabetes control. This criterion was particularly important given associated costs and debilitating complications of poorly controlled diabetes. Although few trials so far have examined the effectiveness of mHealth interventions in this population,42 this study provides evidence to support the use of this modality to provide diabetes education and support to individuals with poor control. The control group also experienced a decrease in HbA1c from baseline to the nine month follow-up, and experienced improvements in secondary outcomes, which could indicate trial effects. Previous research has shown that recruitment to a clinical trial alone can result in improvements in HbA1c,43 but it is not expected that these improvements would be sustainable past the initial few months without intervention. Strengths of the current study included its sample size, diverse population, very low loss to follow-up, pragmatic design, absence of protocol violations, and objectively measured primary outcome. Although the initial sample size target was not reached, the final sample of 366 participants is larger than previous randomised controlled trials in this area. This study contributes valuable evidence to the literature on the use of text messages in diabetes particularly for individuals with poor control. Considering poorer outcomes are experienced by ethnic minority groups, a strength of this study was its high proportion of participants representing these groups. Strengths of the intervention were that it was theoretically based, the information reinforced messages from standard care, and it was system initiated, personally tailored, and used simple technology. These strengths result in high relevance to diverse individuals, increasing the intervention’s reach and acceptability. Unlike SMS4BG, previous diabetes SMS programmes have largely focused on specific groups—for example, limiting their generalisability. Furthermore, the SMS4BG intervention was tailored and personalised to the individual. Although this specificity results in a more complex intervention in relation to its delivery, it appears to be a worthwhile endeavour with high satisfaction and the majority of participants happy with their message dosage. The biggest study limitation was the difficulty with recruitment, which resulted in a sample size smaller than initially planned. One reason for the low recruitment was the required time needed by clinicians to identify and refer patients to the study, which was not always available. Furthermore, many referred patients who did not meet the HbA1c inclusion criteria were still referred because clinicians had thought these individuals would benefit from the programme. This limitation highlights the difference between research and implementation where strict criteria can be relaxed. Alternative methods of recruitment could be explored, such as through laboratory test facilities to ensure access to the intervention regardless of clinician availability. Owing to time restrictions, longer term follow-up of participants was not feasible within the current study, although it is hoped that a two year follow-up of the present study’s participants is possible. The significant group difference seen at three months, dropping slightly at six months, but reaching significance again at nine months, could be an indication of sustained change. Another limitation of the study design was that secondary outcome assessors were not blinded to treatment allocation, which could have introduced bias in follow-up data collection of secondary variables. SMS4BG was delivered in the English language (with the exception of some Māori, Samoan, and Tongan words). With high rates of diabetes in ethnic minority groups, delivery of this type of intervention in languages native to these groups could provide greater benefit. It is likely that some people were not referred to the study, or were unable to take part, due to the criteria that they must be able to read English. SMS health programmes have been translated into other languages such as Te Reo;44 thus, further research needs to look at whether such translations would be of benefit in SMS4BG. With technology advancing rapidly, there is a call for mHealth to move towards more complex technology. However, this study has shown that text messaging—available on any mobile phone—although simple, is still potentially effective for improving glycaemic control. Equally, this study had very few technical difficulties, which probably contributed to the high satisfaction with the intervention. The individual tailoring of the intervention, and ability for participants to choose varying components and dosages, means that questions remain around the ideal duration for implementation as well as the components most important for effectiveness. Further research is needed to understand the components of this intervention that are most effective and the ideal intervention dosage to further refine this intervention and inform the development of future interventions. With participants highly satisfied with the intervention and largely happy with their intervention dosage, but great variance in the modules, durations, and dosages, SMS4BG may need to remain individually tailored in this way, resulting in a more complex intervention for delivery until further investigation on this can be made. This study showed that a tailored and automated SMS self management support programme has potential for improving glycaemic control in adults with poorly controlled diabetes. Although the clinical significance of these results is unclear, and the full duration of these effects is yet to be determined, exploration of SMS4BG to supplement current practice is warranted. We thank the participants who took part in this study as well as the staff at the primary care practices and diabetes clinics across New Zealand who referred their patients to the study; the National Institute for Health Innovation’s IT team for their work on the text message delivery system, and all those involved in the study design and set up; Coral Skipper, Louise Elia, Erana Poulsen, and Hamish Johnstone (Māori Advisory Group members); Aumea Herman (Pacific adviser); Joanna Naylor and Michelle Garrett (content development advisers); Richard Edlin (health economist); Mahalah Ensor (assistance with recruitment); Hannah Bartley, Rachel Sullivan, Anne Duncan, and Gillian Lockhart (research assistants); Michelle Jenkins and John Faatui (data management support); and Karen Carter and Angela Wadham (project management support). Contributors: RW obtained funding for this trial. All coauthors had input into the study protocol. RD, RW, RMu, and MS contributed to the development of the intervention content. RD managed the day-to-day running of the trial and delivery of the intervention. RD and RW collected the data. YJ and RD did the data analyses. All coauthors were involved in the interpretation of the results. RD wrote the article with input from all coauthors. All authors, external and internal, had full access to all of the data (including statistical reports and tables) in the study and can take responsibility for the integrity of the data and the accuracy of the data analysis. All authors approved the final version of this manuscript. RD is guarantor. The corresponding author attests that all listed authors meet authorship criteria and that no others meeting the criteria have been omitted. Funding: The development of SMS4BG was funded by Waitemata District Health Board. The randomised controlled trial was funded by the Health Research Council of New Zealand in partnership with the Waitemata District Health Board and Auckland District Health Board (through the Research Partnerships for New Zealand Health Delivery initiative), and the New Zealand Ministry of Health. The funders were not involved in any way in the preparation of the manuscript or analysis of the study results. No payment has been received for writing this publication. Competing interests: All authors have completed the ICMJE uniform disclosure form at www.icmje.org/coi_disclosure.pdf and declare: support from Waitemata District Health Board for the development of SMS4BG, and support from the Health Research Council of New Zealand in partnership with the Waitemata District Health Board and Auckland District Health Board, and the New Zealand Ministry of Health for the randomised controlled trial; no financial relationships with any organisations that might have an interest in the submitted work in the previous three years; no other relationships or activities that could appear to have influenced the submitted work. Ethical approval: The study received ethical approval from the New Zealand Health and Disability Ethics Committee (14/STH/162). All participants provided informed consent to take part in the trial. Data sharing: The research team will consider reasonable requests for sharing of deidentified patient level data. Requests should be made to the corresponding author. Consent for data sharing was not obtained but the presented data are anonymised and risk of identification is low. The original protocol30 is available from the corresponding author on request. The lead author affirms that the manuscript is an honest, accurate, and transparent account of the study being reported; that no important aspects of the study have been omitted; and that any discrepancies from the study as planned and registered have been explained. International Diabetes Federation. IDF Diabetes Atlas, 7th edn. Brussels, Belgium. https://www.idf.org/diabetesatlas: International Diabetes Federation; 2015.
. Assessing the impact of complications on the costs of Type II diabetes. Diabetologia2002;45:S13-7doi:10.1007/s00125-002-0859-9 .
. Unraveling Different Barriers to Internet Use. Urban Aff Rev2012;48:771-810doi:10.1177/1078087412453713 .
. The effectiveness of text message-based self-management interventions for poorly-controlled diabetes: A systematic review. Digit Health2017;3doi:10.1177/2055207617740315.
. Whaiora: Māori health development.2nd ed. Oxford University Press, 1994.